While most suitcases are boring and just plain black this do make it more difficult to spot it at the airport and that is why this suitcase cover so neat. 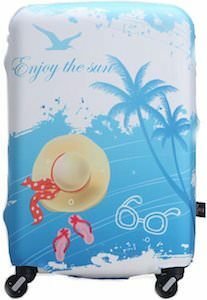 This suitcase cover is white and light blue with typical summer things on it like a hat, flip flops, glasses, palm trees and a bird. And the suitcase cover also says “Enjoy the sun”. Besides personalizing your suitcase this cover also protect your luggage from harm and will keep people out as well as there now is an extra barrier to get to your belongings. You can get this summer suitcase cover in 3 sizes so that it fits you suitcase perfectly and it keeps handles and wheels accessible and is machine washable as well. This entry was posted in Uncategorized and tagged beach, suitcase cover, summer. Bookmark the permalink.